At Spine Care Chiropractic we provide total, natural health care solutions. We ensure that you receive the care, compassion and information you need to enable spine and body to achieve Optimum Health. Because you and your Family deserve it! 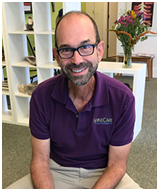 Dr. Stan Marcus is a highly experienced health professional who will work closely with you, providing a seasoned opinion and the expertise to deliver you quality natural health care. For over 30 years Dr. Stan has been helping people on four continents with their natural health and wellness needs. You will be impressed by Dr. Stan’s experience, compassion and gentle approach.